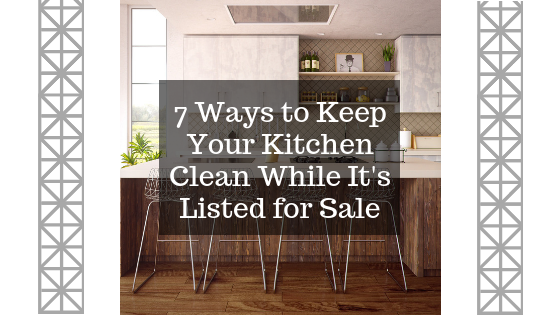 Listing your house for sale can be stressful for many reasons, but we know that one big concern is having to keep the house clean for showings, especially if you have littles running around. The kitchen is the heartbeat of the house and it feels like a never-ending task to keep it ready for showings. We’ve found that doing a few things on a daily basis is the best way to stay ahead of the game and to keep your stress level at a minimum. Check out our advice below and reach out if you have any questions! Set out fresh dish towels every morning. This is a quick and easy trick to give the kitchen a fresh feeling. Some of our sellers have purchased a new cheap set from Ross or TJ Maxx in Coeur d’Alene so that they don’t have to worry about doing several loads of laundry throughout the week. Keep your sink empty. The best way to do this is to unload the dishwasher as soon as the cycle is done, so used dishes never have to wait in the sink. We’d also recommend putting your dish drainer in storage or making it a habit to empty it as soon as possible. It’s really easy to fill it up and then accidentally forget to put it away at the last minute. Wipe down the counters before you go to bed. It only takes a couple of minutes and makes a huge difference. Wipe down your big appliances each night. (There’s almost nothing more attractive than a gleaming fridge!) If you have stainless steel appliances, try to keep the special stainless polish wipes or spray on hand. Ross or TX Maxx is another good place to find these. If you don’t have either, try a mixture of white vinegar and water. Vacuum every night and use a Swiffer mop to do a quick polish every other night. Shining floors speak loudly to potential buyers!